We are the Queensland distributor for Orwak. 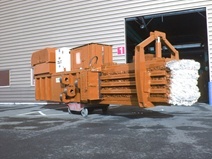 Orwak is a world leader in compaction and baling solutions for solid waste material at source. 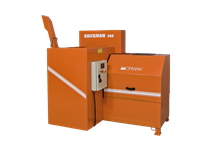 They develop, manufacture and market a comprehensive range of waste compactors, baling systems and the "Brickman" briquette presses for recyclable materials that make waste management more profitable. This is where Orwak’s unequalled technology, expertise and service support make all the difference. When you partner with Orwak, you also gain access to the vast experience we have built up since the start in 1971. Orwak is wholly owned by the Norwegian company Tomra, a leading global player in providing integrated solutions for recovering and recycling used packaging. 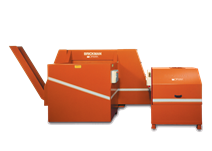 They also offer fully automatic balers for recyclable materials through our subsidiary Presona. 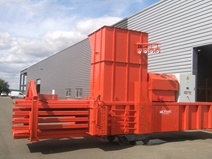 Compact and flexible baler – fits where you need it! 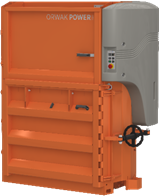 The POWER-baler with the lowest installation height – perfect for environments with reduced ceiling height. 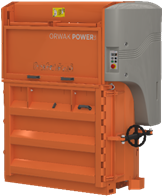 ORWAK POWER 3320 comes with a regular door and is ideal for compaction of soft plastic. Model 3620 is our real heavy-duty model for large volumes of cardboard boxes. With 52 ton press force it provides effective compaction. Meet TOM your new reliable and devoted helper at work! TOM loves crowds and has a good appetite for all what is left over on the tray! 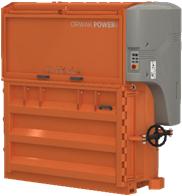 Tracy - our mobile compactors are ideal for mid-sized to large operations, where considerable volumes of waste are generated. 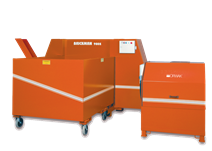 Stacy - our reliable stationary compactors take care of large volumes of waste and the generous loading aperture allows for uninterrupted feeding while the machine is processing the material. A slowly rotating, conical screw shaft pulls in the fed material, crushes it and pushes it into the container. Simply fill in the form below and one of our friendly staff will get in contact with you.